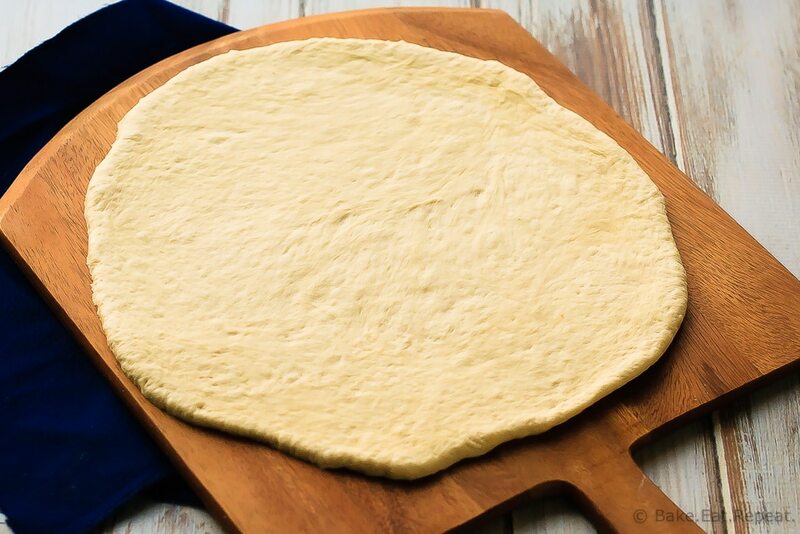 Fast and easy to make no rise pizza dough – you can have scratch, homemade pizza in under an hour – just as easy as take-out! 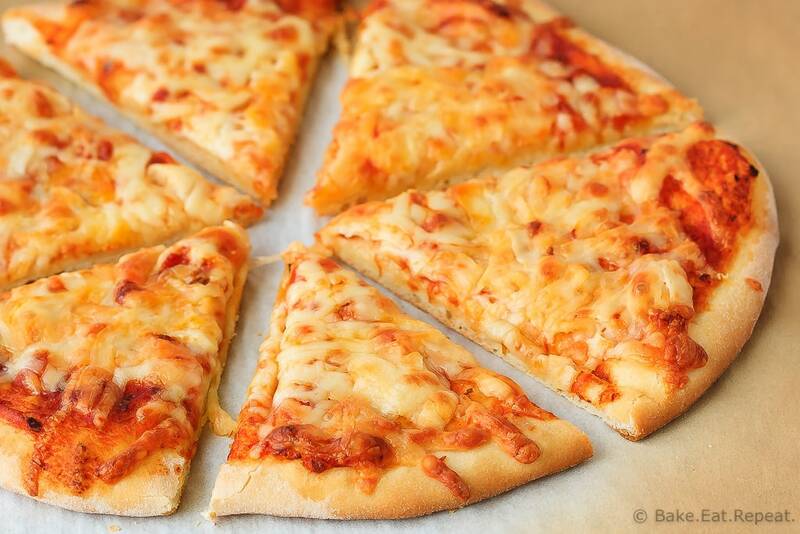 Pizza is one of my family’s favourite foods. Of course, that’s not really saying anything crazy, most people love pizza! Although my son refused to eat it for years – we would always feel a little ridiculous telling him he should try it. It’s pizza. Not really the healthiest of mealtime options. And here we are trying to convince our kid to try it. And like it. Because we all like it, so he should too, right?! All of our coercing to get him to like pizza as much as the rest of us finally paid off this year and he tried pizza for the first time. And now he wants it basically ALL of the time. That may have backfired on us. Possibly. Now my kid that was perfectly happy ignoring the “we felt too lazy to cook so we got takeout” meal is requesting the takeout meal incessantly. It’s like he’s trying to make up for lost time. Can’t really blame him though. Pizza IS fantastic. There’s a reason we all enjoy it! Even though we love to order pizza as much as the next family, we also love to make it. Pizza night is pretty fun, stretching the dough, putting on whatever toppings you like best, making individual personal pizzas if you want. Throw on a movie and it’s a perfect Friday night! My favourite pizza dough recipe is this cold rise pizza dough. It makes a thin crust, fantastic pizza. But….it requires planning ahead. You have to let it rise in the refrigerator at least overnight. I don’t know about you, but I quite often do not plan a whole day ahead when it comes to pizza. Pizza is a spur of the moment decision around here more often then not. And on those nights, this no rise pizza dough is perfect. Easy to make, it’s ready to roll out and spread on your toppings in the amount of time it takes to heat up the oven. It makes a fairly thin and crispy crust, and if you have 15-20 minutes to let it puff up a bit after rolling it out, it will rise just enough to be a bit thicker and chewier. Either way it’s delicious and the perfect answer to the “can we have pizza tonight?” question, that I’m sure is asked often in more houses than just mine! 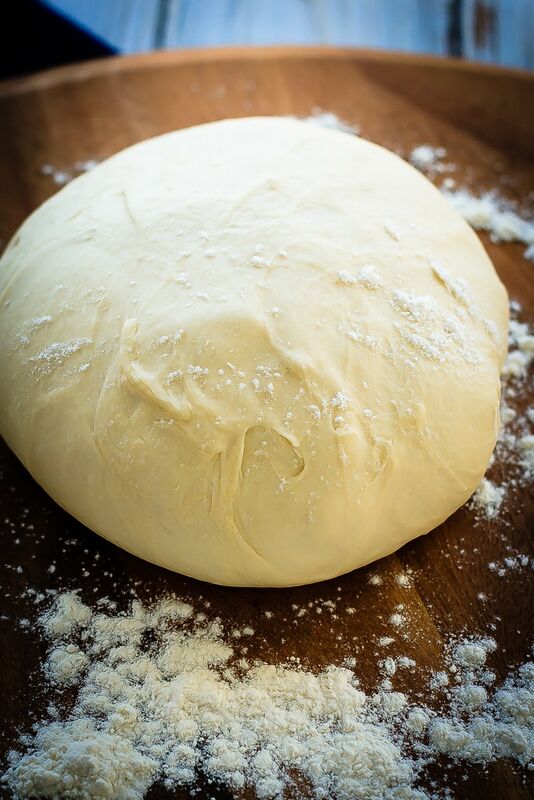 I’ve also shared this No Rise Pizza Dough recipe over on Food Fanatic. This is my first try. I like thin crust but found it just a bit too crisp. What did I do wrong? How long should I heat the stone? I did knead for 10 minutes and let it rest as instructed. Wondering about the oven temp? If it was too crisp for you, you could try with a lower oven temp if you want. The high temperature is so that you get a nice crispy crust (which is how we like it). If you don't want it to be so crisp, maybe let it rise for a few minutes so it's not quite so thin, and/or bake it at 425F or 450F instead. That should help with how crisp it is. I always just put the stone into the oven to heat when I turn on the oven.